Last year marked Reiner Knizia’s thirtieth anniversary of designing games, and to commemorate the occasion, he sent prizes to those who hosted Kniziathons, game marathons featuring only games designed by Reiner Knizia. I didn’t know if any of my friends would go for that, so my unofficial goal last year was to play as many Knizia games as I could. Reiner Knizia has become my favorite designer, so this wasn’t too onerous a task for me. Some of these games I bought, some I tracked down in trade. At the end of my searching and playing, this list represents the ten that came out on top. Without further ado, my utterly biased list of Reiner Knizia’s top ten games. Modern Art was originally released in 1992, and despite its early origin (for the hobby market), it is still decidedly, well, modern. In Modern Art, players are rival art galleries who place art for sale and try to buy the paintings that will fetch the highest prices. Knizia is often derided for having pasted-on themes, but Modern Art is one of the best-themed games I’ve played. There is always a bit of banter at the table as the seller tries to convince other players at the table that this piece of art is their ticket to prosperity, and the popularity of artists serving as arbiter of price is, surprisingly, thematic. 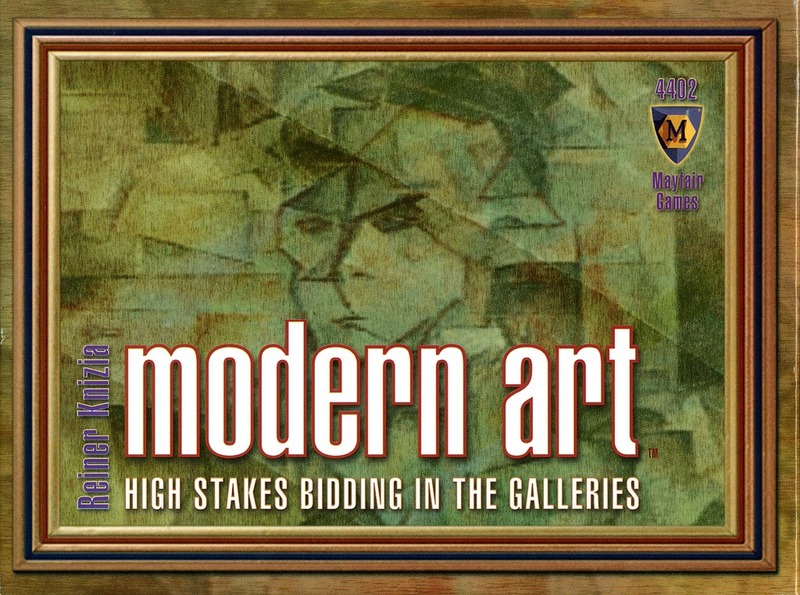 Modern Art is a joy to play, although the auction system in it is somewhat fragile: winning bids are paid to the auctioner, so if players are not on their guard, they can hand the game to someone else. My first encounter with Lost Cities was through an acquaintance not associated with the hobby. She stumbled across my blog on Facebook and wrote, “Have you ever tried Lost Cities? We love it!” In my snobbery, I assumed that Lost Cities can’t possibly be good if it has a wide-enough base to incorporate this person. But here I am, friends, six years after that recommendation, saying that Lost Cities is simply one of the best two-player card games there is (and repenting of my elitism). Players strive to make progress on five separate expeditions. They can increase the value of the expedition before any number cards are played, but cards must always be played in ascending order, and there are only so many of each color in the deck, and you don’t have many to choose from in your hand. 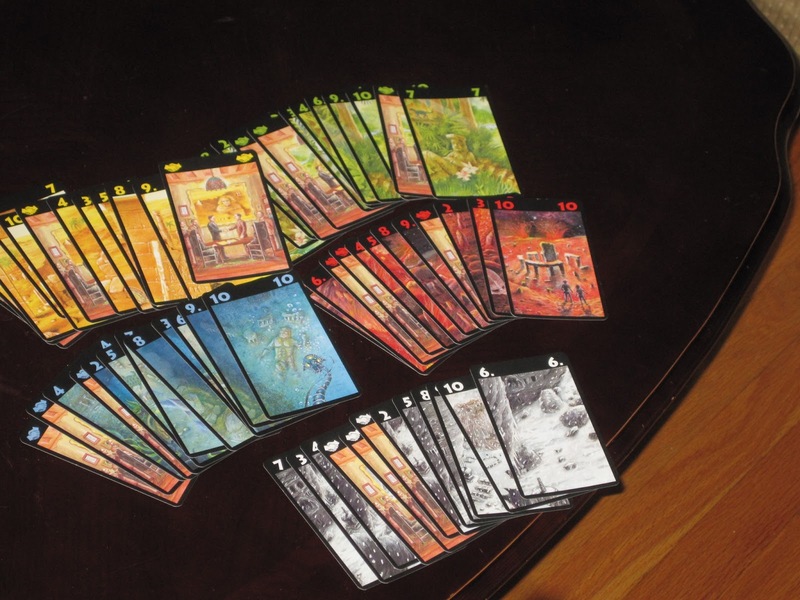 Lost Cities is a game of speculation–of taking measured risks. The game is exciting because players draw a card after they’ve played, which inevitably produces groans. I have on more than one occasion thought, Okay, forget it: I’m just going to start moving on this red now! only to draw the card I was waiting for. 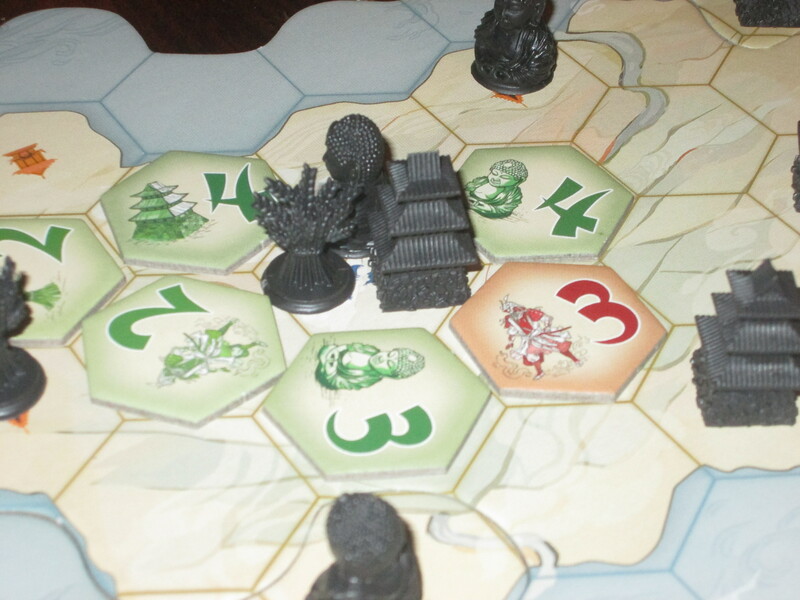 Lost Cities is easy to teach and play, and with a scoring aid, it’s easy to score too. Don’t let its broad appeal fool you: there are interesting decisions here. Samurai is a game I put off playing for a long time because it’s hard to find an audience for tense, cerebral abstract strategy games in these parts. But I finally did get to try it, and it blew me away by its elegance. Samurai is a simple game of hand management. Each player has the same set of tiles, and each tile has a type of caste it can influence (with some weaker tiles influencing all castes). Players place their tiles around caste markers, and when those markers are completely surrounded, whoever exerts the most influence on it keeps the marker. The goal is to collect caste marker majorities: ideally, you want to have the most of each of the caste types, but failing that, you want to have a lot of pieces. The scoring system, the gameplay, the mind games–everything about this game is tense and wonderful. It’s not for the faint of heart, and it’s not something I want to play all the time, but this is a great choice for abstract strategy aficionados. Winner’s Circle is a reprint of Royal Turf, which originally appeared in the Alea medium box series. Winner’s Circle is a recent acquisition, but it has shot to the top of lunch game choices, and even when we can’t finish the prescribed three races in an hour, it’s still a joy. In Winner’s Circle, players place bets (we play with secret betting) on the different horses available, all of which have different strengths. 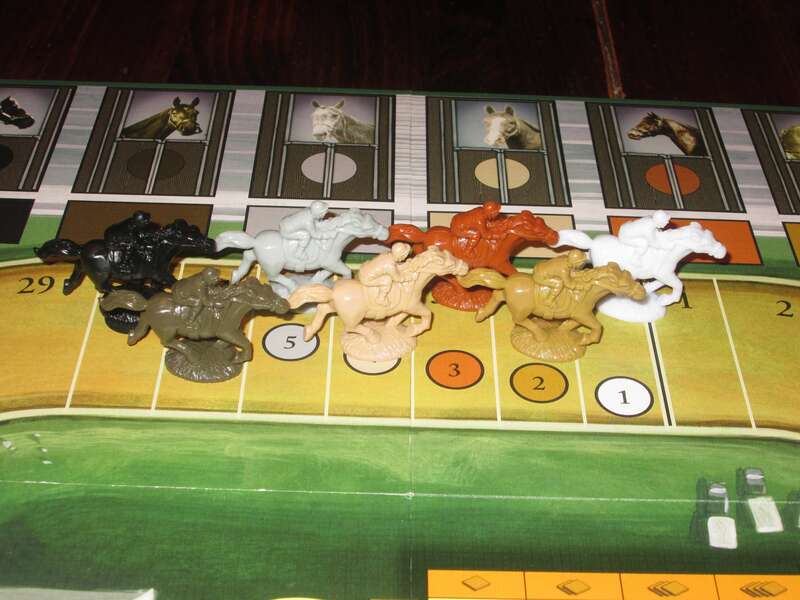 On their turn, players roll the die and choose one of the horses to move. The catch is that there are four symbols on the die–one of them with a 50% chance of being rolled–and thus four ways to move, and players can’t move a horse again until all horses have moved. Winner’s Circle captures the excitement of a day at the races. It’s fun to cheer your horses on and boo the competition. It’s fun to bet on the underdog (poor Regret…) and to cripple the front runner with bad rolls. There is luck involved, but also skill and opportunism, and the hidden bets cause uneasy alliances to form as players try to steer their horses to victory. I’m partial to betting games to begin with, and this is a superb betting game. Through the Desert is a beautiful game. The game comes with many pastel camels, several palm trees, and lots and lots of watering holes. The goal of through the desert is to score the most points by connecting caravans to palm trees, visiting watering holes, walling off portions of the board, and creating the largest caravans of different camels. 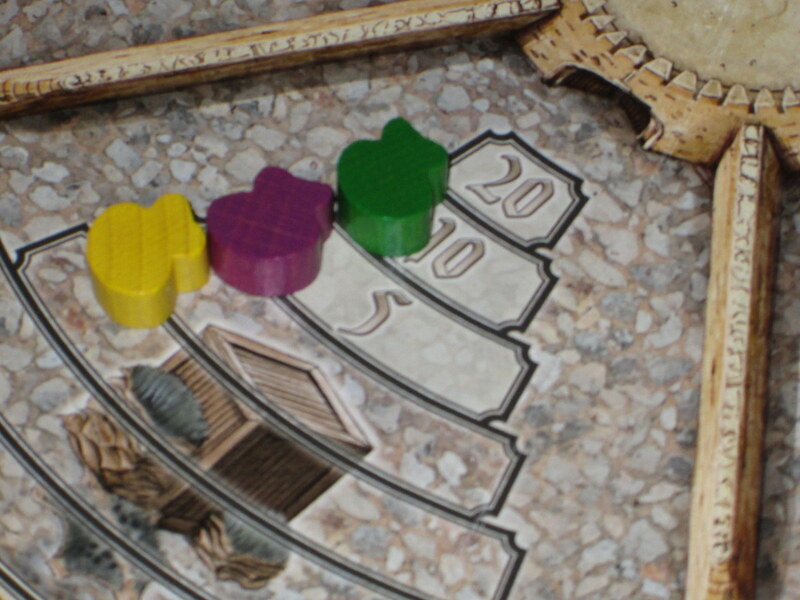 The game is interesting in that each turn, players may only place two camels, but each player could find use for all the camels if the rules allowed. So players have to carefully monitor what the other players are doing and find the best way to head off their strategies while pursuing their own. 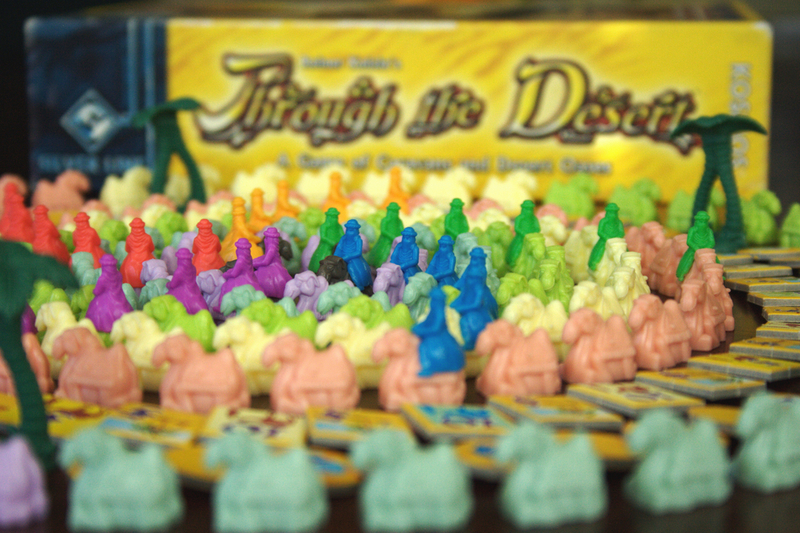 Through the Desert is a simple concept and a simple game to teach, but it is constantly engaging, especially if players are on a similar skill level. Initial placements can mean in a lot in Through the Desert, so that’s something to watch out for. For a game that plays in around 30 minutes, it’s difficult to get the depth of Through the Desert. Taj Mahal doesn’t seem like an auction game, but as Shannon Applecline argued about the similar Blue Moon, it kind of is. 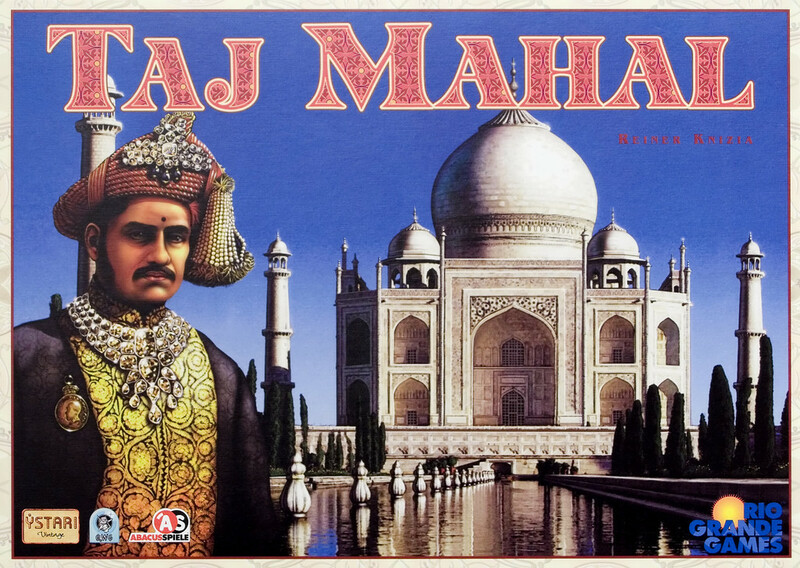 The game is organized around 12 “visits,” the last of which always finishes in the province that holds the Taj Mahal. In each visit, players have a binary choice each turn: play cards or withdraw. If they play cards, they must be of the same color each turn for the visit, and each card has one or two symbols on them corresponding to the province marker and/or one of five courtiers. If a player withdraws, if the player is winning in any of the six symbols, that player wins that contest for the province, getting the rewards (usually the ability to place palaces there and/or collect goods). The trick in Taj Mahal is strategic retreat: knowing when your hand just isn’t good enough and knowing when to press the attack. I’ve been in a bind several times by having an almost-good-enough hand, which is much worse than bowing out early and gathering strength for the next round. Taj Mahal is a bit difficult to wrap your mind around, but it moves quickly once you know what you’re doing. This game is a very interesting exercise in hand management. Amun-Re is a little bit of everything. It has auctions. It has area majorities (kind of). It has a little economics. And it has bribing and robbing an ancient deity. What’s not to love? 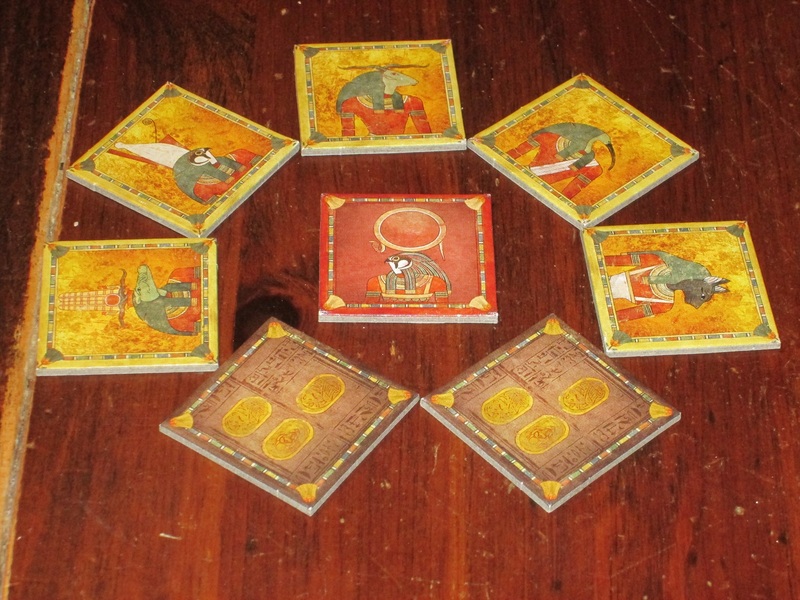 Amun-Re is played in two epochs, each of three rounds each. In a round, players bid for provinces, get the stuff in their provinces, and then have the opportunity to fit up what they’ve collected with pyramids, farmers, and special cards. Finally, there’s a sacrifice to Amun-Re, when each player contributes money (or contrives to steal it). The total pot determines how much each farmer produces, but those who were most generous to Amun-Re receive benefits in the game. After one epoch is finished, the board resets (except for pyramids and building stones and players’ positions) and players play, essentially, a second time, only this time the provinces have a different value. I haven’t played this one much, but it is utterly fascinating, and it’s a game I want to know better. What can I say about Ra? There’s so much genius in this list already, hardly anything I say can possibly live up to the hype of number one. 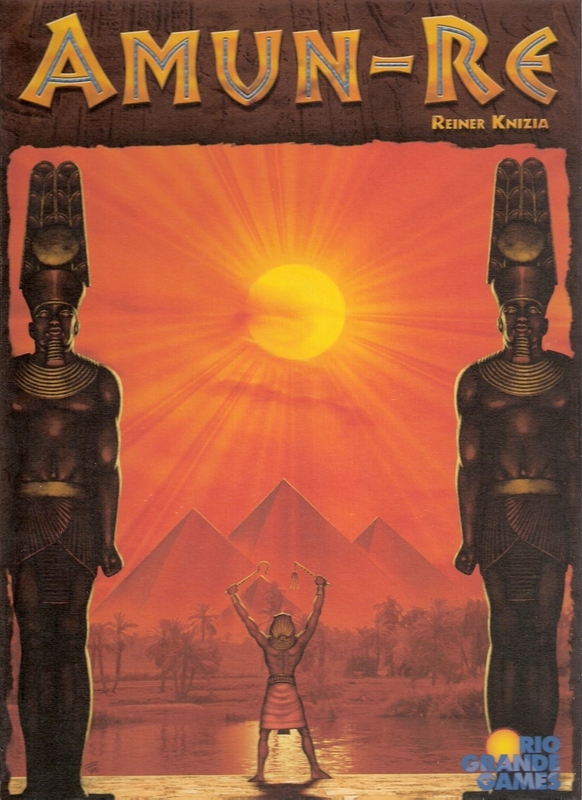 But if a game can bear it, it has to be Ra, named for the top god in the Egyptian pantheon. Ra has lots of neat thematic flavor, which provides some good reminders for how tiles score, but there’s not much feeling of being Egyptian. You’re almost more apt to feel like you’re in Vegas. Each turn has players drawing a tile from the bag or calling an auction. Unlike most other auction games, where the currency is points, in Ra, it doesn’t really come down to that. Rather, you are bidding with opportunity, and when you use your bidding chip, it will likely go to someone else. This is good if you’re at the bottom of the pile, but if you’re at the top, it has you evaluating what’s up for auction a little differently. And I think this is what makes Ra such an achievement: there is very little overhead for how much valuation takes place in the game. I can play the game with new players, and they are able to understand that a lot is much better for me than it is for them with just a glance. Or they can know that a lot is good for me and great for them, banking that I’ll bid low. But the fun of Ra is in those in between places, where humans don’t always act as predicted. Maybe more tiles are added to the auction track when you think an auction will be called. Or maybe someone calls an auction before you were planning to bid. Maybe the auction is more about the bidding tile than it is about the goods on the track. There are several moving parts in the game that blend together in a brilliant package. This game is over 15 years old, and it’s still one that I’m almost always willing and even itching to play. Auctions are not always dry and dusty, even when they take place in Egypt. Games that almost made the list include Pickomino, Blue Moon, and The Lord of the Rings, each for different reasons. What about you? 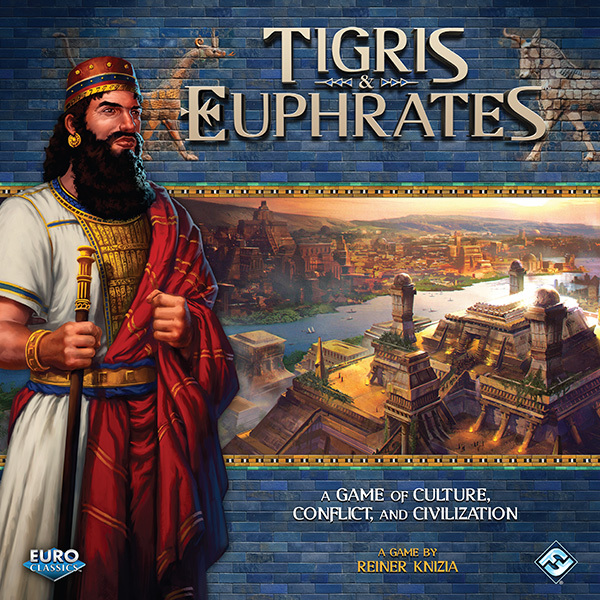 What are your favorite games by Reiner Knizia? Nice read but no Battle line in your top10, not even in the “almost made it to” list! How come? Do you consider it an inferior game compared to Lost Cities, or not necessary to have both? Wondering since your such a Knizia fan Lenny. Dr K is my favourite designer. I still have my 1995 version of Medici, and Modern Art was a revelation 26 years ago. Personally, I`d switch positions 1 & 2 around. I just find Medici more tense than Ra. Also Ra is very unforgiving for new players.